The new Ford Fusion continues to be a game changer among midsize sedans, with the most technologically advanced lineup ever – including two hybrid models and a new all-wheel-drive Fusion V6 Sport engineered to leave other family sedans in the dust. Fusion V6 Sport and the new Fusion Platinum add to a lineup featuring three EcoBoost®engine choices, along with two hybrids, Fusion Hybrid and Fusion Energi plug-in hybrid – something neither Toyota nor Honda offers midsize sedan shoppers. 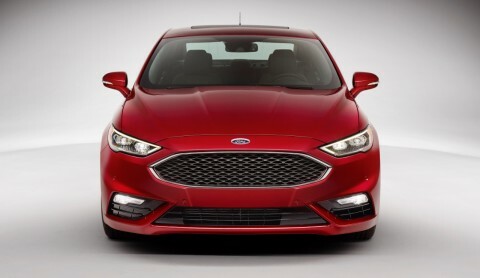 “Fusion offers people a lot more car – including helpful technology, beautiful design and a more rewarding driving experience than other midsize sedans,” said Raj Nair, Ford executive vice president and chief technical officer, Global Product Development. Together, Fusion V6 Sport, Fusion Hybrid and Fusion Energi, and Fusion Platinum offer three different flavors of an award-winning lineup for midsize sedan customers. Fusion V6 Sport adds continuously controlled damping for real-time suspension tuning based on setup and road inputs. The system features pothole detection technology that, in less than the blink of an eye, adjusts the shock absorbers to greatly reduce the severity of impact transmitted to occupants. Power and handling are complemented by unique, performance-inspired style inside and out. The look is distinguished by an aggressive exterior with deeper air intakes and a gloss black-finish mesh grille, 19-inch wheels, rear spoiler and dual twin exhaust outlets. Fusion Hybrid and Fusion Energi are technology-packed electrified vehicles that offer an advanced EcoGuide system to provide drivers real-time coaching to get even better fuel economy. Fusion Energi features a 7.6-kilowatt-hour lithium-ion battery for an expected range of 19 miles using electric power only. The car automatically switches to an efficient 2.0-liter gasoline engine when the battery is depleted, allowing customers to drive more than 500 miles. Ford continues to innovate and evolve with its lithium-ion batteries that save weight and take up less space than the less sophisticated nickel-metal hydride batteries found in Toyota Camry Hybrid. Neither Camry nor Accord offers a plug-in hybrid. Recharging Fusion Energi can be done overnight in just 2.5 hours. The car is smart enough to know when to begin charging to get electricity at the lowest price. It can even preheat or precool the cabin before drivers leave to save more fuel. Both electrified Fusions deliver impressive overall performance with electric-only speeds up to 85 mph. Regenerative braking captures up to 95 percent of the energy lost through heat during braking and recharges the hybrid battery on the move. 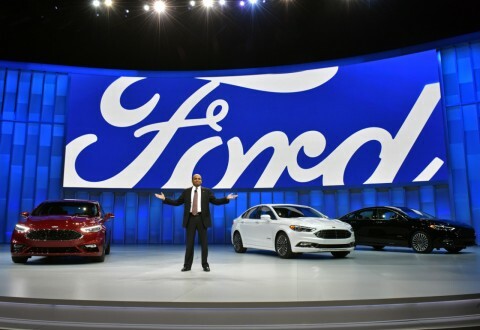 Meaningful technologyFusion is the most technologically advanced midsize car Ford has ever built in North America – the first car sold here with Ford’s pedestrian detection system. Fusion also has hands-free parallel and perpendicular parking capability. 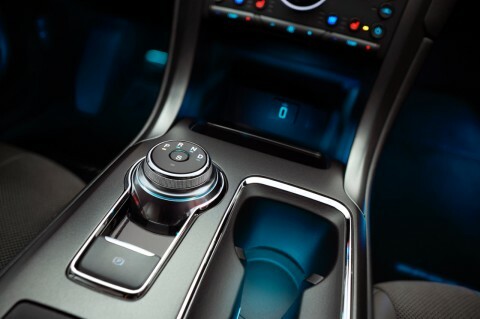 The new high-tech gear shift dial results in a roomier cabin with easy-to-reach bins. Lane-keeping assist helps drivers maintain proper lane position using a small, forward-facing camera behind the rearview mirror that “looks” at the road ahead – monitoring lane lines to ensure the car is on course. Available Blind Spot Information System with cross-traffic alert includes sensors in the car’s rear quarter-panels that can detect traffic in a driver’s blind spot, providing both audible and visual warnings if traffic – unseen by the driver – is detected. BLIS®enables cross-traffic alert, warning the driver of oncoming traffic when backing out of a parking space with obstructed views. In combination with the standard rearview camera, BLIS makes for confident maneuvering in parking lots. SYNC®3, Ford’s new communications and entertainment system, is also available. It features faster performance, more conversational voice recognition, a more intuitive smartphone-like touch screen and easier-to-understand graphical interface. SYNC Connect, optional with SYNC 3, enables owners to remotely start their car, schedule future starts, or lock and unlock the car using their smartphone. The new Fusion arrives at dealerships this summer. Fusion V6 Sport follows a few weeks later.